Another common kitchen ingredient that produces a surprising reaction is corn flour. When you touch a flame to a spoonful of corn flour, it does burn, but nothing terribly interesting happens. But, when you blow the flour through a funnel, it reacts with the flame in a much more explosive way. This reaction is caused by the increase in surface area. When you separate the particles, there's more surface area for the oxygen to react with them, so when combined with a butane torch, the result is a big ball of fire. The smaller the particles, the larger the fireball. 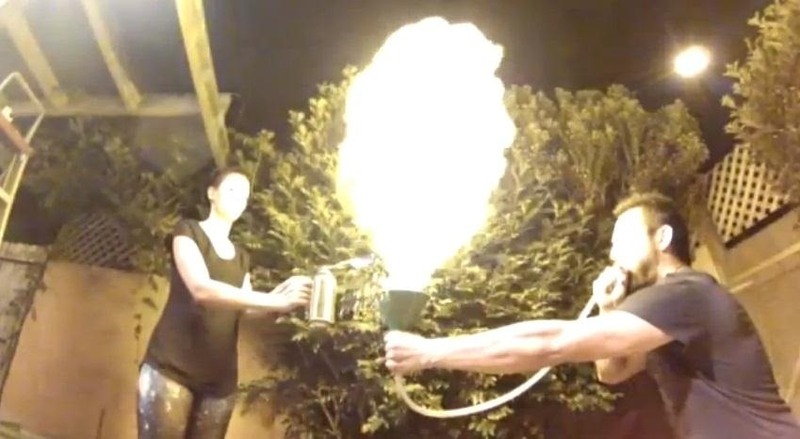 The results are better when you use a shorter funnel, but that also puts you closer to the flame, so it's probably a good idea to wear some protective gear. Check out the video by Veritasium to see it in action. And make sure to post any of your corn flour fireball tries in the comments below! Just please be safe (and have adult supervision).